There was a reasonably-sized crowd at Rex's opening until it's closing. Rex, a writing professor at the Corcoran, had a unique party. 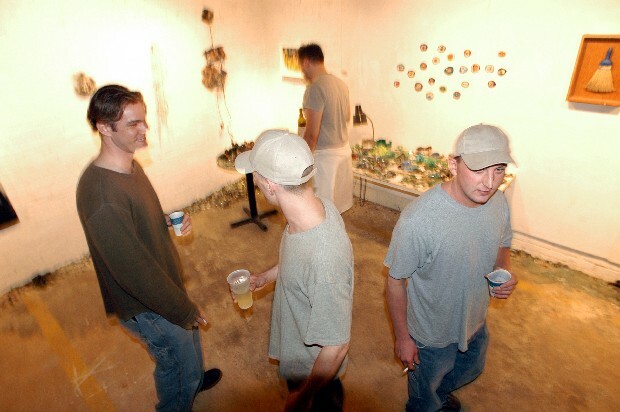 Many of the art pieces displayed were made of broken bottles and broom sticks. As the night went on mixtures of diet soda, sherry, and gin infected the ability to make rational decisions. The art became a backdrop for a social evening that was awkwardly comfortable. As Rex kicked the last of the last out after 3 am I wondered where everyone went. Instead of getting a ride like a good goer I decided on the late-night pedestrian express.